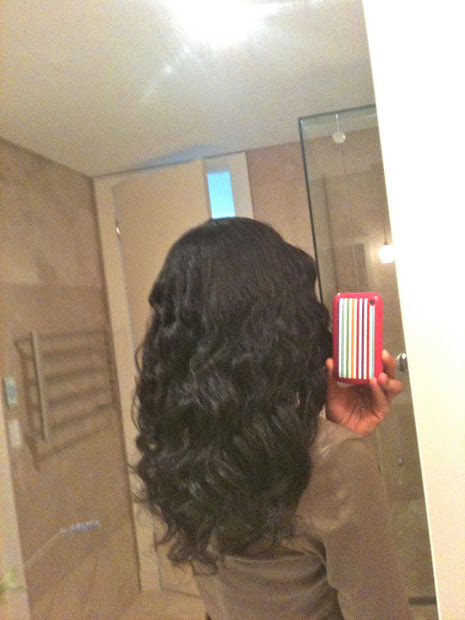 Healthy Relaxed Hair Feature: How does she get such perfect hair? Lucky for us, she was gracious enough to share all of the details of her hair care routine. So without further adieu, here are your questions answered about Pink's perfect hair. What is your current length and hair texture? "I am currently at waist length. It seems my hair has multiple textues: it's coily in some areas and wavy in others. My hair is thick and requires a combination of moisture and smoothing products." How long did it take to get to your current length? "With the exception of the time I cut my hair to ear length, it's always been bra strap length or longer. It probably to 2 years to grow from mid back length to waist length. I've never focused on growing my hair any length, just maintain healthy hair. My husband would always use my bra strap as a guide and cut above it. However, once I started trimming less, air drying, stretching and eating healthy, my hair grew more." Are you relaxed or texlaxed? How often do you touch up, which relaxer do you use? For years I visited the salon. Every 6-8 weeks I would get a touch up until my husband and I were relocated overseas and he volunteered to help with my touch ups. Now I touch up 2-3 times a year with Affirm Sensitive Scalp. I started using Affirm at the recommendation of my cousin who is a salon owner. He suggested using Affirm because it's a great relaxer designed for sensitive scalps. I usually stretch for 5 to 6 month. Currently I am 5 months post. Tell us about your daily and weekly regimen. "I've always had a simple regimen. In the morning: I use a small amount of coconut oil mixed with avacado oil a few times a week. If my hair is dry, I use Kerastase Sublimateur Jour followed by the oil mix. If my hair is dry, I use Kerastase Nutritive Oleo-Relax Nuit, folled by the oil mix. I also massage my scalp a few times a week with the oil mix. I usually shampoo weekly. I pre-poo overnight with coconut oil, shampoo with Kerastase Dermo-Calmor, Kerastase Bain, Nutri-thermique, deep condition with Kerastase Oleo Relas Slim and Kerastase Masque Nutrithermique using heat. I also use a mix of apple cider vinegar and spring water as a final rinse. I incorporated the ACV into my regimen after moving to an area here the water is hard. The ACV also leaves my hair smooth and aids in detangling. I mix 3 tablespoons of ACV with 2 cups of Spring Water in a bowl and pour in the mix on my hair. This is my final rinse after deep conditioning. I leave the rinse in my hair and apply my leave-ins. For my leave-ins, I use Kerastase Oleo Relax Slim, Kerastase Nectar Thermique and Kerastase Oleo Relax Serum. I air dry in two ponytails and flat iron or 2-ponytail rollerset or braid out. I apply my leave-ins to wet (not dripping) hair while in the shower. For my heat protectants, I use Chi Silk Infusion and Redken Smooth Down Heat Glide. In my opinion, the Redken offers more heat protection and the Chi gives my hair a silky, smooth feel. I also use protein and clarify as needed. " How do you wear your hair throughout the week? "When I'm home or working out, I wear a loose bun or clipped up with a flexi8. When I'm out I wear my hair down or in a ponytail. Twice a week, at night, I curl my ends with medium size satin covered rollers and cover with a silk scarf. Other nights I sleep with a loose bun and a silk scarf. If I'm wearing a braid-out, I re-braid nightly." Do you use direct heat? If so, how often? "Yes I use heat, In fact, I usually experience more dryness and shedding when I wear heat-free styles. I usually alternate between heat styling with braid-out and bantu knot-outs. I try to limit the sue of heat styling by air drying. I flat iron on 300 degrees with my Cloud Nine wide iron using the chase method." How do you maintain moisture levels and manage breakage? "Most of the moisture in my hair comes from my diet: drinking lots of water and eating foods containing water. I also use products with moisture and use silk scarves and sleep caps. In the past, I used a hair steamer, which was great at adding moisture. The first time I experienced breakage was recently after my husband and I were relocated to Australia. Since my arrival in June, I've been battling extreme dryness and some breakage. Nothing seemed to work until I tried Kerastase Oleo fusion and a black tea rinse. The Oleo fusion has made my hair soft and mosturized. The black tea risne stopped the breakage. I also have few products from the Kerastase resistance line and will incorporate into my regimen when needed." Do you do anything internally, such as diet, vitamins, etc, to promote healthy hair? "Definitely! I love healthy foods, especially Asian food. I eat salmon twice a week, a variety of beans, nuts, fruit and vegetables: kale, broccoli, brussel sprouts, bok choy, kiwi, dragon fruit, and many others. A few months ago, I purchased a large bobble and that has helped me incorporate more water into my diet. Normally, I fill-up my large bobble three times a day which is roughly 102 ounces of water. I drink green tea and take a multivitamin. I try to eliminate the white stuff: sugar, salt, and flour. However, good chocolate is my downfall." Winter is around the corner, are you doing anything to prepare your hair for the colder weather? "Winter has come and gone! The winter season in Australia is June-August. When I arrive in June it was the beginning of winter. It seemed like immediately my hair and scalp became dry. I had to add a second shampoo to my regimen, Kerastase Dermo-Calm to help with dry scalp. I also started using coconut oil as a pre-poo and daily nourishment for my hair." You're stuck on a desert island and you can only have 3 hair related items with you. What would they be and why? "Oh geez, only 3. Well, I would definitely need coconut oil. It softens my hair and conditions my scalp. Kerastase Oleo Fusion is another one I would need. It leaves my hair silky smooth for weeks. I would also need my seamless combs. When I'm past 8 weeks post, I use a combination of 4 combs to detangle and smooth. The 4 Comb Smooth method involves using multiple combs to detangle and smooth your hair as if you were roller setting. It use this method because the longer I stretch, the thicker my hair becomes. It involves using an extra wide too comb, a wide tooth comb, a medium tooth comb and a fine tooth comb. 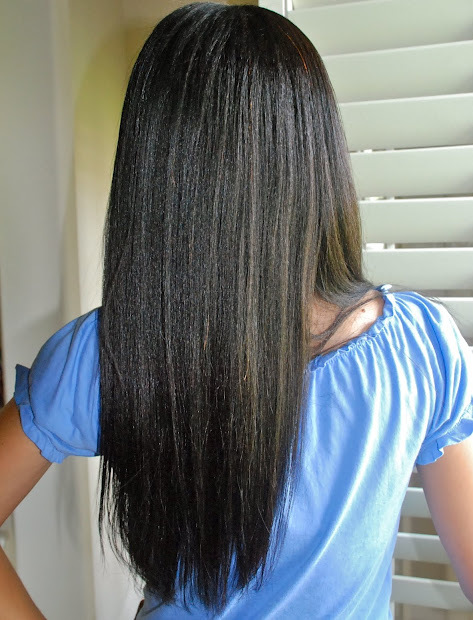 Depending on the density of your hair, you may only need two or three combs to achieve smooth, detangled hair. " Some random stranger offers you $1million dollars to help her create healthy hair just like yours within a specific period of time, how would you do it? "I would begin with making sure they were eating right: getting adequate protein, water, fruit and veggies. This step is not an overnight fix, but eventually eating right will aid in healthy hair. Next I would look at the condition o the hair and scalp. Does the hair have split ends and in need of a trim or cut, is it lacking moisture or protein, is the scalp unhealthy, etc? I would also develop a regimen and make product suggestions based on the hair texture and condition. I would inquire about their hair practices: are they protecting the hair at night, using excessive heat, wearing hair styles that add stress to the hair, improper detangling? And I would evaluate the condition of the hair tools and make recommendations." Anything else you'd like to add as a word of encouragement or any other hair care tips you'd like to share? "Don't get discouraged and don't jump on every bandwagon. When you discover what works for you, stick with it! Begin with a simple regimen, selecting products based on your hair texture (porosity, densit, etc). Make a list of products that worked and those that didn't work. Doing this allows you to look at the ingredients in those products that didn't work and avoid them when making future purchases. Most importantly, be patient and allow your regimen to work." I'm grateful for Pink's sharing. From her feedback, I was reminded of how important it is to start with a great relaxer. I also noticed how she uses quality products in her regimen. I've never tried Kerastase's products before but now she has me intrigued. Her comment about the ACV rinse reminded me of how important it is to do this step every wash day. I vow to be more consistent. Pre-pooing overnight is so beneficial to the hair. No wonder her locks look so healthy. Pink is one of those people who can use heat effectively in her regimen. I can tell from her sharing that she doesn't take any risks when using heat. Lots of heat protectant and a low temp on her flat iron help her avoid heat damage. Did you notice how Pink's first area of focus, if offered $1million dollars, would be on the wealthy stranger's diet and eating habits? It's the foundation to healthy hair and I'm certain her diet of leafy greens, omega filled seafood, and lots of water are a key component to having a head of hair like hers. Her hair is so beautiful! I'm so glad you featured someone here in Australia as it gives me so much hope for the future. I'm definitely going to look around to see if any of the products she mentioned are around me cause summer is around the corner for us Aussies. I really enjoyed this article. Thanks to both you and "Pink" for sharing this wonderful information. I love this post, I also strive to eat very healthy, I'm on the paleo diet right now, because I'm not suppose to eat, flour. My diet is just protein, fish(snapper when available), fruits and vegetables, water. I also take a multivitamin every other day. Sometimes I eat something that's not apart of the diet. I tried the Green House Method which can be found on Youtube for a week and it really helped with my split ends. I find that like Pink Protective styles cause me to have more breakage and that using the flat iron is the best in eliminating that. Some of the things she does are similar to what I do or tried before of course my products are different, my hair is getting better and better and is at full bra strap length. I'd love to know how she gets her hair to curl like that. What does she use? Her hair is GORGEOUS! Thanks so much. Lawdddddd, her hair is SO gorgeous! I read thru some of her comments about the Kerastase line on LHCF...and I love that she found what works and is willing to invest. PinkPearls, what do you think of the Sally's version? Have you compared any of those items? PINKPEARLS.... OH WOW, OMG I really love your beautiful head of hair. "I haven't tried the Sally's version of Kerastase, so I can't comment. Kerastase has many different lines, so it's about finding what works for your texture, needs and routine. My hair is thick and I air dry, so some of the slim products work well for me. In addition to the slim products I also need moisture, so I usually combine moisturizing products with smoothing or slim." The curl was created using a flat iron, and then rolling my hair into a horizontal french roll (without pins) and securing overnight with a Du-rag (one without the long tail)." "I've heard the sun in Australia is so strong that it has the highest levels in the world. To prevent sun damage, I plan to incorporate a few products from the Kerastase Soleil line (sun protection for hair exposed to the sun), get a touch-up (I'm currently 5 months post) and wear more heat-free styles. I also plan to buy a few fancy Australian hats." What are slim products from Pinks responses? She seems to like moisture n "slim" over protein n I would love to know since Iam protein sensitive. Gaw-jus!!! Can you get more details about the black tea rinse? I grew my hair from shoulder length to waist length in two years!! Her hair is gorgeous! Glad to see someone else who loves Kerastase products. There are only a few of us on LHCF who like Kerastase, most people believed Paula Begoun when she said kerastase products are identical to l'oreal being as they are the same company. Although I love other brands, I saw a visible difference when using kerastase. My favourites are the Sublimateur Jour, the night serum, the oleo relax shampoo and serum. I'm looking forward to the launch of kerastase fibre architect (ceramides!). @ Anon-Since writing the post I picked up the Nutri-Thermique mask and I love it. I also got the Sublimateur Jour today and Ciment Thermique. Can't wait to try them. I picked up the Ciment because I saw the ceramides in the ingredient list. The ceramides were low on the list though. @ Sweetlntent, Kerastase has a line of products, Oleo Relax Slim, designed to decrease volume in hair, which is great when I air dry. Slim products are also referred to as smoothing. I use a combination of smoothing/slim products and moisturizing. IMO, smothing products don't provide enough moisture for my thick hair. I use protein sparingly. My protein comes mostly from healthy sources, moisturizing and conditioning protein in my products, and products that behave like protein. However, I recently added a few moisturizing protein treatments to use when needed. @ Alisha, I recently moved to an area where the water is extremely hard and loaded with chlorine and other minerals. I started noticing broken pieces of hair, which I've never experienced. Among other things, I decided to try a black tea rinse to help with the breakage; it decreased, but gradually returned. However, once I found and installed a shower filter, the breakage slowly stopped. I appreciate all the lovely comments. Thank you so much. @Pink: Do you relax your hair bone straight or do you texlax? Your hair is GORGEOUS. Hi, you have interesting post! i'm definitely going to bookmark you! Thank you for your info. beautiful hair. great site. thanks for sharing. Dear Nadege, I first found your blog about a year ago but I have not visited in a very long time - that was a mistake I do not intend to make again. Firstly, can I just say how beautiful you are (you remind me of one of my nieces!) and your hair is beautiful also. I wanted to thank you for this post, as I have read many magazines and visited many websites & blogs, and I still have to say that Pink's is the healthiest head of hair I have ever seen. In the past I have avoided European hair products as I believed they would strip my hair, but after reading this post I rushed to buy the Biotic Bain Bio-Recharge shampoo for dry hair, as this was the nearest I could find to the Dermo Calm in the UK. I noticed the difference as soon as I started to wash my hair, and my hair (which is very dry, coarse and thick) has NEVER felt like this before. In fact, I think it has also made my hair grow in just 2 weeks - I will keep you posted on this to make sure it is not just my imagination. I will now make sure that Kerastase products are a payday priority, and I will be telling everyone who will listen about these products and also your blog. I think that you should contact Kerastase to see if Pink could be their Global Ambassdor - the pictures on here are better than many advertisements costing thousands of pounds (or dollars)! Apologies for the long comment, but you just might have changed my life! Wow, your comment made my day. I'm so glad the products are making a difference in your hair. I too have fallen in love with Kerastase products. Keep us updated on your progress! One thing that detracts from your lively and informative writing style is the typographical errors. I can understand if this just your hobby/labor of love and you're not trying to be nit-picky. But if you're going for a more professional feel I'd suggest a bit more editing. Thanks for your feedback Becky. I'll definitely take that into consideration. I do not usually take that much care of it. It's nice to see an article on healthy relaxed hair. Thanks Nadege for this feature, Pink pearls hair is so beautiful and such an inspiration. After reading the interview I studied her regimen and the only difference it had to mine were the Kerastase products, which I do not intend to invest in right now. I was willing to give the coconut oil pre-poo a try though. The first time I used coconut oil as a pre-poo was last week before my co-wash; I left it in my hair for 6 hours with just a shower cap over my hair. When I took off the shower cap, I couldn't believe how incredibly soft but strong my hair was. My hair was not hard but I could feel that it was stronger. I went on with my co-wash routine and my hair remained soft throughout the week. I gave it another try yesterday, just to be sure it really was the coconut oil that was working wonders on my hair. I left it on my hair overnight this time and I had the same results after shampooing - soft, strong hair with very little shedding. It's definitely become a staple. The best part is that it's fuss-free and economical. Will be looking at purchasing some Kerastase products next. Thanks again. 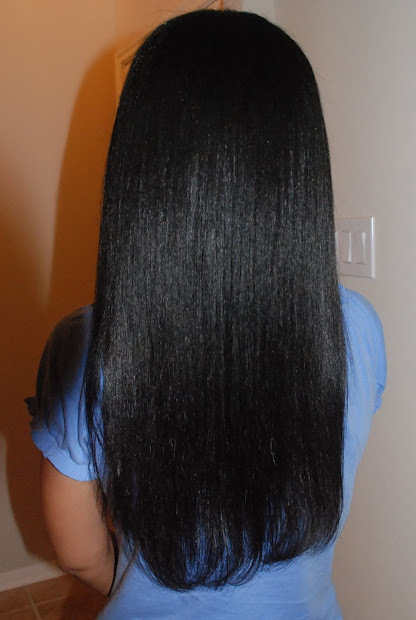 I found this blog after searching for Keratase products for relaxed hair. I found one salon in my area that carries Keratase. I purchased a Nutritive shampoo conditioner and masque which put a nice dent in my pocket BUT! I used all three this morning and I was shocked and pleasantly surprised at the reduced amount of hair that went down the drain and that was in my comb after detangling. My hair feels and looks (and I hate using this word) AMAZING!!! Even my husband noticed. I will definitely be on the lookout for additional products mentioned in this article.